Most people assume that the chupacabra, like its cryptozoological brethren Bigfoot and Nessie, dates back many decades or centuries. However, as discussed in my book Tracking the Chupacabra: The Vampire Beast in Fact, Fiction, and Folklore and in the pages of the Skeptical Inquirer, the origin of the mysterious vampire beast el chupacabra can be traced back to a Puerto Rican eyewitness who saw the 1995 film Species, which featured a nearly identical monster. Though both vampire legends and “mysterious” animal predation date back many centuries, there seems to be no evidence of any blood-sucking “chupacabra” before the 1990s. The chupacabra has two origin stories invoked to help explain its sudden appearance: the first is that the creature is an extraterrestrial brought here by visiting aliens; the second is that the chupacabra is an escaped entity created in a top-secret U.S. government genetics laboratory experiment gone wrong—essentially a classic conspiracy-laden Frankenstein scenario. Not coincidentally, these two origin stories are identical to those of Sil, a chupacabra-like monster in the film Species (see Figure 1 and Radford 2014). Figure 1a. The movie monster from the film Species. Figure 1b. 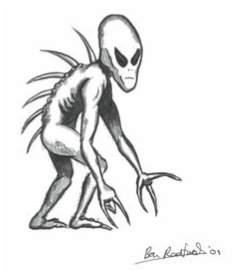 The “chupacabra” first described in 1995 in Puerto Rico by eyewitness Madelyne Tolentino, which she’d recently seen. Illustration by the author. This fictional story, while making for an entertaining tale, runs the very real risk of being taken as a genuine historical legend by the book’s readers. Though De Aragon clearly created the story, he implies that it is based on a legend told to him as true. Folklorists are careful to give references and citations for the stories they offer, to demonstrate both scholarly diligence and proper attribution, but these are unfortunately absent in De Aragon’s book. Figure 2. 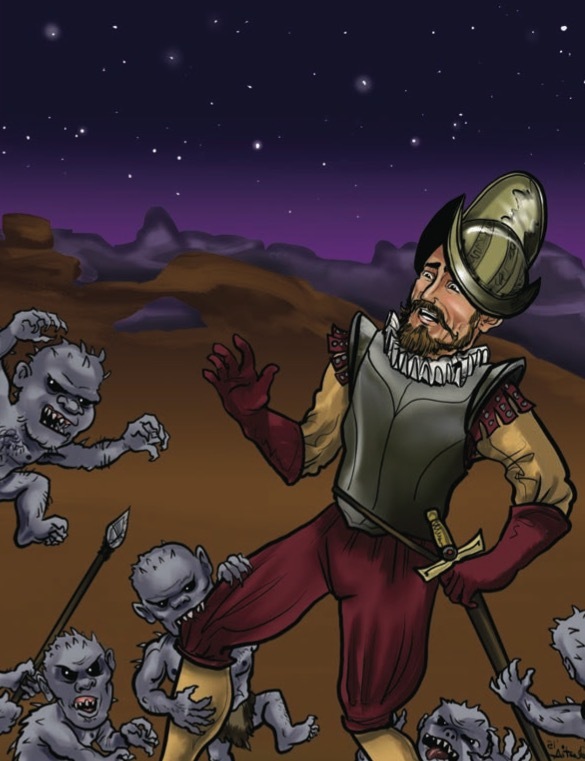 A garbled—and possibly nonexistent—legend suggests that conquistador Francisco Vázquez de Coronado encountered knife-wielding cannibal dwarves while exploring what is now New Mexico in the 1500s. Illustration by Celestia Ward. Even if De Aragon had heard some odd kernel of a demon vampire story that he embellished into his chupacabra tale, the details and facts he offers are so far removed from the original sources that any historical account of a real chupacabra encounter is hopelessly lost and garbled. 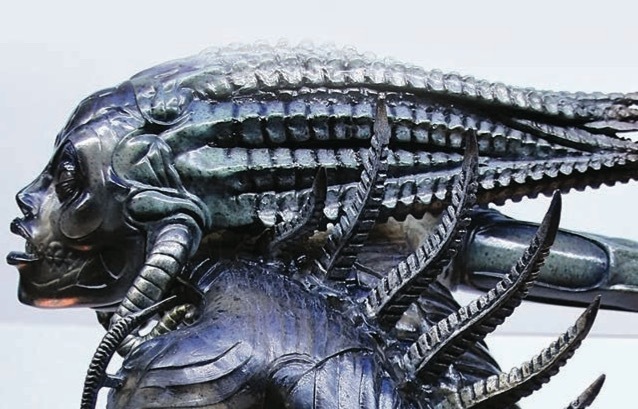 Absent even a shred of corroborating evidence (for example, a written historical mention of the creature or even an independent “eyewitness” account of an encounter with one), it’s safe to assume that this “legend” is wholly fictional. There are many clues that this story—confused as it is—is not true. To his credit, Curran does offer several caveats about its veracity (“a legend says . . .” “it is told that . . .” etc. ), and as with De Aragon’s legend it’s important to pay attention to this story’s fifthhand provenance: Curran is describing what a legend says that Coronado claims about what he heard from Zuni Indians when they told him about what their forefathers told them they did a half-millennia ago. I have no idea what, if anything, this alleged legend means, and Curran clearly doesn’t either. Spanish conquistador Coronado was of course attacking and killing Zunis, not swapping friendly stories with them, and it’s possible that the tribe told him the stories of the savage knife-spined dwarfs as an indirect warning to Coronado of the dangers his men faced in the area unless they moved along. Even if the legend is true—and there’s no reason to think it is—there’s also the problem that Spaniards and Indians didn’t speak the same language; in fact, the two groups communicated largely through hand signals and rough interpretations. In his book Cities of Gold: A Journey Across the American Southwest in Pursuit of Coronado, Douglas Preston (1992) describes several instances in which the meanings of words and messages got mangled and mistranslated between Coronado and Zunis (chickens were mistaken for turkeys and cattle for buffalo, for example). When communicating important messages from Coronado “it is unclear just how much of this the Zuni understood,” Preston notes, which is not surprising since messages between the groups were “explained through signs” (285). Preston states that Coronado “asked the Indians to paint a cloth for him showing all the animals in the area, which they did” (304). It depicted buffalo, elk, coyotes, and other known animals—yet the chupacabra was conspicuously missing. A more serious problem is that—even assuming for the moment that details of the legend are true and that Coronado accurately understood and reported what he heard from the Zuni—there’s no clear connection with the chupacabra. Chupacabra have appeared in various forms and been reported to have a disparate variety of features including wings, a tail, red eyes, and so on—none of the reports described “small, dark, horny-skinned men” or “strange grey men” or “ferocious [warrior] dwarves” armed with torches and spears. Even assuming the description has some basis in fact, the “knives” mentioned on the backs could simply describe where these mysterious “dwarves” sheathed their blades. The vampirism claim, though also superficially aligned with the chupacabra, is in fact unremarkable and standard lore universally used to demonize enemies (with echoes of the blood libel myths as well). Curran offers another (even more confusing and improbable) version of this story in his book American Vampires: Their True Bloody History from New York to California. It concerns Coronado’s expedition whose cattle were attacked one night. Cannibals, of course, eat their own kind and therefore the “chupacabras” Curran describes would be neither extraterrestrial nor canid nor demon but instead human—an identification reinforced by the descriptions of them as “little men” using spears. But of course this “legend” is not internally consistent, as these “chupacabras” are also magical shape-shifting creatures. Other pseudohistories of the chupacabra can be found in a sensational, special edition of the Spanish-language magazine Contacto OVNI (UFO Con-tact), which contains an article titled “El Chupacabras Hace 70 Anos” (“70 Years of the Chupacabra”) and offered wild conjecture about the creature’s origins, including a section titled “Chupacabras of the Pre-Atomic Era,” which tries in vain to link the beast to a wholly unrelated 1925 news story about animal predation in Africa (Romero 1996). The booklet goes on to theorize that the Tainos’ reverence for the El Yunque rainforest and the deities they believed existed there (claimed by some to be the home of the original chupacabra) allowed the animal to thrive there. 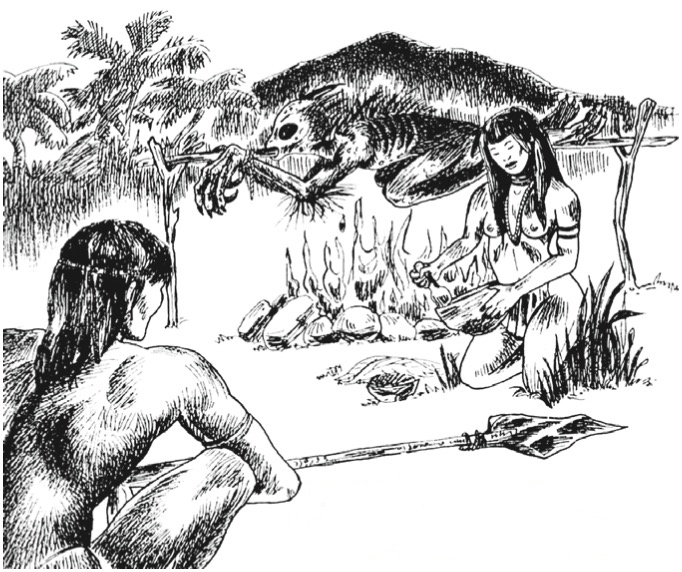 Nonetheless, the Tainos would apparently hunt—and sometimes eat—the chupacabra, as depicted in a fantastic drawing illustrating a stereotypical scene of an armed Taino man watching a woman preparing food next to a chupacabra being roasted on a spit over an open fire (see Figure 3). Perhaps the most outlandish fictional origin story for the chupacabra presented as speculative fact comes from writer Scott Corrales, contributing a chapter on the beast to a book of conspiracy theories. In it he quotes a Chilean researcher named Ferrer who was told by an elderly man that “‘his grandfather’s grandfathers’ were well aware that these predators [chupacabras] existed and that they were, in fact, gods who came to leave messages. In the past, these messages were articulated as complete sentences, but now they were numerical in nature . . . 666—the mark of the beast” (Corrales 2004, 127). Corrales gives free rein to this fact-free speculation and conjecture, concluding by asking ominously, “Who or what are these strange deities feared and worshipped by the ancient Atacamans [people from Atacama, Chile]? . . . . What would occur if the Atacamans neglected to perform the [blood sacrifice] ritual? Did their deities send monstrous minions [i.e., chupacabra] to collect the blood they needed?” (Corrales 2004). Figure 3. Taino couple roast a chupacabra over an open fire. From La Verdadera del Chupacabras. San Juan, Puerto Rico: Redaccion Noticiosa. I’ve discovered several examples of fabricated pseudohistories of the chupacabra, ranging from Zuni medicine man pet to vampiric minions sent by Mesoamerican deities to spear-wielding cannibal shape-shifting dwarves. I don’t begrudge authors their speculative historical fiction—Curran and De Aragon are fine storytellers who offer vivid, engaging stories based on myths and legends—but one false explanation is as good as any other absent references or documentation. The true history of the chupacabra is a fascinating and improbable story in its own right, full of conspiracy theories, vampire lore, and media hype. Presenting fabricated stories as “legends” only serves to blur the lines between fact and fiction—lines that researchers such as myself have worked hard to clarify (for years I have had a standing, unclaimed $1,000 reward for any verifiable, published pre-1990s reference to a vampiric chupacabra anywhere in the world).The gradual expansion of what is popularly called a “chupacabra” is common; in my book I describe how the word originally referred to a very specific alien-type creature in the mid-1990s but had expanded to include hairless canids by 2000, and by 2010 virtually any animal not immediately identifiable was dubbed (either informally or by the news media) as a chu-pacabra. This same phenomenon has occurred in the literature as well, with stories under the name “chupacabra” retroactively applied to legends and rumors that historical figures claimed to have heard about some strange encounter. Since the references here predate the publication of my research, it’s too soon to tell what effect, if any, it will have in correcting the record. The migration of narrative themes seen in these and other pseudohistories of the chupacabra is to be expected. Rumor, urban legends, and folklore are not fixed but instead are constantly changing. As the researcher who first identified the origin of the chupacabra, I can lament the confounding stories that have emerged around this Hispanic vampire beast. However, the forces of folklore cannot be stopped, and trying to correct the record is a Canutian task. Folklore has a life of its own, and the best I can do is explain the true origin of the chu-pacabra back as far as I can and help document the monster’s spread in pop culture. The information is there for those who wish to look, but I know better than most that the truth never stands in the way of a good story. There have, of course, been various attempts to place mythical creatures within an evolutionary framework. For a fascinating look at taxonomical attempts to find a place for fairies, water spirits, and angels in a Darwinian worldview, for example, see Charles W. Leadbeater’s 1913 book The Hidden Side of Things. It’s not clear in this legend why animals that look and act exactly like coyotes—which are well known to attack livestock, including goats and cattle—were assumed by locals to not be coyotes at all but instead chupacabras that had cleverly changed into coyote form before attacking the livestock. This seems rather like assuming that a pet dog that soiled the floor must have really been an unknown shape-shifting animal at the time—instead of the dog it obviously was—because a beloved pet wouldn’t do that. Curran told me: “According to my notes it comes from a book which I was shown in the Biblioteca National in Barcelona a good number of years ago. The book is Las Adventuras del Gran General Francesco de Coronado, Explorador y Goberndor de Nueva Galicia y Otres en America and the date I have for it is 1895. For some reason I don’t have the author but it is published in Madrid or so my notes say. It is in Catalan Spanish (I think that it’s Catalan) but I got a friend to translate some portions for me” (Curran 2013a). De Aragon, Ray John. 2012. Enchanted Legends and Lore of New Mexico: Witches, Ghosts, and Spirits. Charleston, South Carolina: The History Press.Preston, Douglas. 1992. Cities of Gold: A Journey Across the American Southwest in Pursuit of Coronado. New York: Simon & Schuster. Romero, Armando Nicolau. 1996. El Chupacabras hace 70 anos. In Contacto OVNI—Edicion Especial. Corporativo Mina, Mexico.